NEW, FORTHCOMING & RECENTLY PUBLISHED BOOKS FROM APPLE ACADEMIC PRESS Volatile Organic Compound Analysis in Biomedical Diagnosis Applications Editors: Raquel Cumeras, PhD, Martí Franquès Programme, Universitat Rovira i Virgili, Catalonia, Spain Xavier Correig, PhD, Department of Electronic Engineering, Universitat Rovira i Virgili, Catalonia, Spain Presents a thought-provoking state-of-the-art picture of how volatile compounds are used in metabolomics, currently a hot topic in the metabolomics field. It provides a thorough description of what volatile organic compounds are, why they are important in biomedicine, and what the analytical platforms are used. ISBN: 978-1-77188-744-1 / ebook ISBN: 9780429433580. 292 pages with index. 12 color and 38 b/w illustrations. £116.00. November 2018. Women Scholars: Navigating the Doctoral Journey Editors: Jelane A. Kennedy, EdD, Counselor Education and Family Therapy Department, Central Connecticut State University Beverly A. Burnell, PhD, State University of New York at Plattsburgh Provides an enlightening ethnographic look at women and their doctoral developmental experiences. The book's aim is to empower women to be able to contextualize their experience while also offering support and inspiring readers to consider alternative ways to successfully approach the doctoral process. ISBN: 978-1-77188-678-9 / ebook ISBN: 9781351202633. 332 pages with index. £108.00. December 2018. Mobile, Wireless and Sensor Networks: A Clustering Algorithm for Energy Efficiency and Safety Amine Dahane, PhD, Intelligent Systems Research Laboratory, University of Sciences and Technology of Oran, Algeria Nasr-Eddine Berrached, PhD, Electronics Department, University of Science and Technology of Oran, Algeria The authors use an approach based on computing of the weight of each node in the network as the proposed technique to deal with this problem. They present a virtual laboratory platform of baptized mercury, allowing students and researchers to make practical work on different aspects of mobile wireless sensor networks. ISBN: 978-1-77188-679-6 / ebook ISBN: 9781351190756 Approx. 265 pages with index. 6 color and 126 b/w illustrations. £124.00. Forthcoming May 2019. Crop Production Technologies for Sustainable Use and Conservation: Physiological and Molecular Advances Editors: Münir Öztürk, PhD, Department of Botany, Ege University, Izmir, Turkey Khalid Rehman Hakeem, PhD, King Abdulaziz University, Jeddah, Saudi Arabia Muhammad Ashraf, PhD, DSc, Pakistan Science Foundation, Islamabad, Pakistan Muhammad Sajid Aqeel Ahmad, PhD, University of Agriculture, Faisalabad, Pakistan With the focus on sustainability and conservation issues in crop production, the chapters present molecular and physiological research and innovations for increasing yield, quality, and safety while also taking into considering increasing demand, diminishing water and land resources, and the agricultural consequences of climate change on crop production. ISBN: 978-1-77188-726-7 / ebook ISBN: 9780429469763 484 pages with index. 9 color and 45 b/w illustrations. £124.00. March 2019. Contact Dynamics: Method of Differential Specific Forces Nikolay Goloshchapov, PhD, NNG—Engineering & Physics Consultancy, London, United Kingdom Describes the application of the method of the differential specific forces (MDSF). By using this new method, the solutions to the problems of a dissipative viscoelastic and elastic-plastic contacts between curvilinear surfaces of two solid bodies can be found. This volume shows that this method allows finding the viscoelastic forces for any theoretical or experimental dependencies between the distance of mutual approach of two curvilinear surfaces and the radiuses of the contact area. This new method of differential specific viscoelastic forces allows us to find the equations for all viscoelastic forces. ISBN: 978-1-77188-683-3 / ebook ISBN: 9781351166522 322 pages with index. 23 color and 31 b/w illustrations. £131.00. February 2019. Green Consumerism: Perspectives, Sustainability, and Behavior Editors: Ruchika Singh Malyan, PhD, MBA, Business Administration, Meera Bai Institute of Technology, Government of NCT of Delhi, India Punita Duhan, MBA, Business Administration, Meera Bai Institute of Technology, Department of Training and Technical Education, Government of NCT of Delhi, India “Enables readers to comprehend the concept of green consumer behavior, which has led to various green marketing initiatives being taken by companies. This book puts together the work of researchers and consultants working in this field from across the world. . . . An excellent reference resource and a handbook for detailed and up-to-date knowledge about green consumer behavior.”— Prof. B. K. Punia, Maharishi Dayanand University, Rohtak, India ISBN: 978-1-77188-694-9 / ebook ISBN: 9781351138048 410 pages with index. 22 b/w illustrations. £116.00. November 2018. New & Forthcoming Titles from Apple Academic Press Design and Construction of Laboratory Gas Pipelines: A Practical Reference for Engineers and Professionals James Moody, Consulting Engineer Specializing in Medical and Laboratory Gas Systems, Australia “Long overdue and finally fills a void that has been present in this industry for many decades. It deals with the design and safe installation of different gas systems and is written in plain English suitable for both the novice or expert. Importantly it is written in textbook style where each chapter is complete by itself in dealing with each specific gas and thereby not necessitating that each reader read the entire document. . . . In my personal experience, if a book like this had existed three decades ago, my own work would have been much improved. . . . It is this type of [the author's] personal knowledge that this book describes that has been gathered over a lifetime career. I cannot recommend this book more highly for those of us that always want the get things perfectly correct.”—From the Foreword by Professor Klaus Matthaei, PhD, Head (now retired), Gene Targeting & Stem Cell Laboratory, The John Curtin School of Medical Research, The Australian National University Instructs design engineers, laboratory managers, and installation technicians on how to source the information and specifications they require for the design and installation of laboratory gas systems suitable for their intended use. ISBN: 978-1-77188-723-6 / ebook ISBN: 9780429469732 376 pages with index. 63 b/w illustrations. £131.00. March 2019. Advanced Molecular Plant Breeding: Meeting the Challenge of Food Security Editor: D. N. Bharadwaj, PhD, Department of Genetics and Plant Breeding, C.S. Azad University of Agriculture & Technology, Kanpur, India “An outstanding compilation of genetics and genomics that can drive progress in modern plant breeding. The chapters are well designed by several specialist scientists/breeders from diverse specialized areas in the field of plant breeding. A wonderful job in integrating information about traditional and molecular plant breeding approaches. . . . A benchmark reference for experienced breeders, researchers, teachers and students alike.”— From the Foreword by M. S. Swaminathan, Founder Chairman, M. S. Swaminathan Research Foundation ISBN: 978-1-77188-664-2 / ebook ISBN: 9780203710654 726 pages with index. 5 color and 34 b/w illustrations. £139.00. November 2018..
Aneesa Padinjakkara, International and Inter University Centre for Nanoscience and Nanotechnology, Mahatma Gandhi University, India Provides in-depth knowledge and recent research on polymers and nanostructured materials from synthesis to advanced applications. Leading researchers from industry, academia, government and private research institutions across the globe have contributed to this volume. GLOBAL BIODIVERSITY, 4-volume set: Volume 1: Selected Countries in Asia Volume 2: Selected Countries in Europe Volume 3: Selected Countries in Africa Volume 4: Selected Countries in the Americas and Australia Editor: T. Pullaiah, PhD, Former Professor, Department of Botany, Sri Krishnadevaraya University, Andhra Pradesh, India Provides a wealth of insightful information on the biodiversity of selected nations around the world, with informative summaries of the available data on both wild and cultivated plants, wild and domesticated animals, and microbes of the different nations selected. Each chapter covers the geographical status, ecosystem diversity, species diversity, genetic diversity, conservation efforts in that particular country. The authors provide statistical data on plants, animals, and microbes of that country along with genetic diversity with the focus on crop plants/cultivated plants and domesticated animals and their wild relatives. Endangered plants and animals and protected areas are discussed. 4 volume set: ISBN: 978-1-77188-751-9 / ebook ISBN: 9780429433849 2100 pages with index. 462 color and 7 b/w illustrations. £500.00 UK. December 2018. Global Biodiversity, Volume 1: Selected Countries in Asia ISBN: 978-1-77188-707-6 / ebook ISBN: 9780429487743 548 pages with index. 119 color and 2 b/w illustrations. £131.00. December 2018. Global Biodiversity, Volume 2: Selected Countries in Europe ISBN: 978-1-77188-717-5 / ebook ISBN: 9780429487750 510 pages with index. 157 color and illustrations. £131.00. December 2018. Global Biodiversity, Volume 3: Selected Countries in Africa ISBN: 978-1-77188-722-9 / ebook ISBN: 9780429469800 452 pages with index. 126 color and 4 b/w illustrations. £131.00. December 2018. Global Biodiversity, Volume 4 : Selected Countries in the Americas and Australia ISBN: 978-1-77188-750-2 / ebook ISBN: 9780429433634 590 pages with index. 60 color and 1 b/w illustrations. £131.00. December 2018. Sabu Thomas, PhD, International and Inter University Center for Nanoscience and Nanotechnology, Mahatma Gandhi University, Kottayam, India “Provides useful substantive and informative platform for future research in environmental protection and nursing of our ecosystem. The book covers various topics such as biopolymers in the textile industry, nanotechnology for intelligent food packaging, cashew nut shell liquid-based advanced functional materials, etc., which one may not usually find in other books dealing with biomaterials.”—Laly A. Pothen, Bishop Moore College, India ISBN: 978-1-77188-615-4 / ebook ISBN: 978-1-315-16198-3 386 pages with index. 15 color and 122 b/w illustrations. £124.00. December 2018. Nanocarriers for Brain Targeting: Principles and Applications Editors: Raj K. Keservani, CSM Group of Institutions, Allahabad, India Anil K. Sharma, Delhi Institute of Pharmaceutical Sciences and Research, University of Delhi, India Rajesh K. Kesharwani, PhD, Department of Advanced Science & Technology, NIET, Nims University Rajasthan, India Covers recent research on brain physiology and the development of drug delivery systems and explores a diverse variety of strategies that can be employed to achieve drug targeting to the brain. The nanocarriers that are discussed include nanoparticles, vesicular carriers, carriers having carbon as a core constituent, dispersed systems, and more. ISBN: 978-1-77188-730-4 / ebook ISBN: 9780429465079 Approx. 593 pages with index. 13 color and 59 b/w illustrations. £139.00. Forthcoming May 2019. Advanced Polymeric Materials for Sustainability and Innovations Editors: Sajith Thottathil, MTech, International and Inter University Center for Nanoscience and Nanotechnology, Mahatma Gandhi University, India Sabu Thomas, PhD, Mahatma Gandhi University; International and Inter University Centre for Nanoscience and Nanotechnology, India Nandakumar Kalarikkal, PhD, International and Inter University Centre for Nanoscience and Nanotechnology Didier Rouxel, PhD, Université de Lorraine, Nancy, France; Team Leader, Micro and Nano Systems, Institut Jean Lamour, France Discusses recent advancements in the research and development of synthesis, characterization, processing, morphology, structure, and properties of advanced polymeric materials, with a special focus on ecofriendly polymers, polymer composites, nanocomposites, and blends and materials for traditional and renewable energy. ISBN: 978-1-77188-633-8 / ebook ISBN: 9781315102436 388 pages with index. 44 color and 102 b/w illustrations. £124.00. October 2018. New & Forthcoming Titles from Apple Academic Press Mangroves for Building Resilience to Climate Change: A Field Manual R. N. Mandal, PhD, Indian Council of Agricultural Research, Central Institute of Freshwater Aquaculture (ICAR-CIFA), India R. Bar, PhD, Department of Botany, Bangabasi Morning College, University of Calcutta, India “This field manual explains in simple terms what scientific research has revealed about the mangrove plants, their environment, and how the plants and the environment interact. It provides an up-to-date account of the mangrove plants, their detailed identification and associations, their specific habitat requirements and adaptations, their reproductive strategies, and the management requirements of these plants to ensure their sustainability and conservation in a period where climate change provides acute challenges to this group of plants. The authors bring unique expertise and the passion to convey the latest information about these fascinating plants.”—From the Foreword by Peter Saenger, Emeritus Professor, Centre for Coastal Management, School of Environment, Science & Engineering, Southern Cross University, Australia ISBN: 978-1-77188-716-8 / ebook ISBN: 9780429487781 362 pages with index. 32 color and 152 b/w illustrations. £116.00. December 2018. Theoretical Models and Experimental Approaches in Physical Chemistry: Research Methodology and Practical Methods Editors: A. K. Haghi, PhD, Editor-in-Chief, International Journal of Chemoinformatics and Chemical Engineering & Polymers Research Journal; Member, Canadian Research and Development Center of Sciences and Cultures Sabu Thomas, PhD, Mahatma Gandhi University; International and Inter University Centre for Nanoscience and Nanotechnology, India Praveen K. M., University of South Brittany, Laboratory IRDL PTR1, Research Center “Christiaan Huygens,” Lorient, France Avinash R. Pai, International and Inter University Center for Nanoscience and Nanotechnology, Mahatma Gandhi University, India Presents an up-to-date review of modern materials and physical chemistry concepts, issues, and recent advances in the field. It presents a modern theoretical and experimental approach in applied physical chemistry. The volume discusses the developments of advanced chemical products and respective tools to characterize and predict the chemical material properties and behavior. ISBN: 978-1-77188-632-1 / ebook ISBN: 9781315102634 448 pages with index. 19 color and 100 b/w illustrations. £124.00. October 2018. Francisco Torrens, PhD, Universitat de València, Spain Brings together innovative research, new concepts, and novel developments in the application of new tools for chemical and materials engineers. 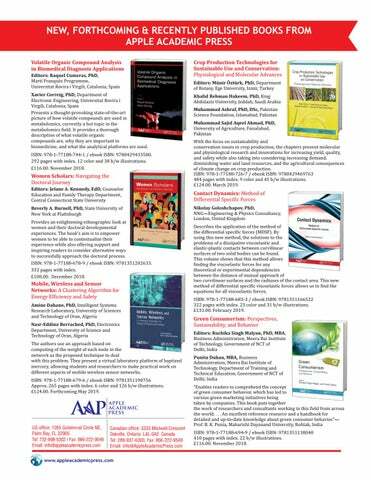 It provides a collection of innovative chapters on new scientific and industrial research from chemists and chemical engineers at several prestigious institutions. It looks at recent significant research and reports on new methodologies and important applications in the fields of chemical engineering as well as provides coverage of chemical databases, bringing together theory and practical applications. ISBN: 978-1-77188-637-6 / ebook ISBN: 9781315100449 356 pages with index. 11 color and 83 b/w illustrations. £124.00. October 2018. Prem Prakash Srivastav, PhD, Agricultural and Food Engineering Department, Indian Institute of Technology, Kharagpur (WB), India Altafhusain B. Nadaf, PhD, Department of Botany, Savitribai Phule Pune University, Pune, Maharashtra, India Addresses three important agricultural aspects of rice: physical characteristics, physico-chemical characteristics of rice, and the organoleptic aspects of rice. Divided into four parts, the book first looks at recent trends and advances for higher production and quality improvement of rice, which covers climate-resilient agricultural practices. The book looks at climatic effects, relative performance, and constraints in direct seeded versus transplanted rice of Asia, constraints in temperate rice culture, and interventions to mitigate the challenges, along with recent advances and trends in system of rice intensification (SRI). ISBN: 978-1-77188-712-0 / ebook ISBN: 9780429488580 402 pages with index. 14 color and 27 b/w illustrations. £131.00. December 2018. Focuses on important areas of microbiology related to soil and environmental microbiology associated with agricultural importance. ISBN: 978-1-77188-669-7 / ebook ISBN: 9781351247061 428 pages with index. 16 color and 39 b/w illustrations. £139.00. March 2019. Addresses efforts to overcome the shortcomings of conventional dosage forms by exploiting the principles of nanoscience to deliver drugs for medical treatment. Addresses the recent biotechnological and molecular tools and techniques that are utilized to increase rice production, highlighting new technologies that are being researched and utilized for increasing the overall production of strong rice crops throughout the world. ISBN: 978-1-77188-701-4 / ebook ISBN: 9781351047562 422 pages with index. 12 color and 39 b/w illustrations. £131.00. October 2018. ISBN: 978-1-77188-692-5 / ebook ISBN: 9781351136587 382 pages with index. 23 color and 28 b/w illustrations. £131.00. December 2018. Editors: Md Saquib Hasnain, PhD, Shri Venkateshwara University, Gajraula, Amroha, U.P, India Amit Kumar Nayak, PhD, Seemanta Institute of Pharmaceutical Sciences, Odisha, India Explores the latest research on the use of alginate as a biopolymer in various biomedical applications and therapeutics, including tissue regeneration, encapsulation and delivery of drugs, nucleic acid materials, proteins and peptides, genes, herbal therapeutic agents, nutraceuticals, and more. This book also describes the synthesis and characterizations of various alginate and modified alginate systems, such as hydrogels, gels, composites, nanoparticles, scaffolds, etc., used for the biomedical applications and therapeutics. ISBN: 978-1-77188-782-3 / ebook ISBN: 9780429023439 646 pages with index. 8 color and 133 b/w illustrations. £193.00. March 2019. Nanoparticulate Drug Delivery Systems Editors: Raj K. Keservani, MPharm, CSM Group of Institutions, Allahabad, India Anil K. Sharma, PhD, MPharm, Department of Pharmacy, School of Medical and Allied Sciences, GD Goenka University, India Focuses on nanoparticulate nanocarriers and recent advances in the field of drug delivery. ISBN: 978-1-77188-695-6 / ebook ISBN: 9781351137263. 446 pages with index. 4 color and 33 b/w illustrations. £124.00. January 2019. Omari V. Mukbaniani, DSc, Iv. Javakhishvili Tbilisi State University, Faculty of Exact and Natural Sciences, Department of Chemistry, Georgia Heru Susanto, PhD, Indonesian Institute of Sciences, Computational Science & IT Governance Research Group Reflects the huge breadth and diversity in research and the application of industrial and engineering chemistry and cheminformatics. The book presents cutting-edge research developments that present new insights and that emphasize the vibrancy of industrial and engineering chemistry and cheminformatics today. ISBN: 978-1-77188-666-6 / ebook ISBN: 9781351247450 376 pages with index. 21 color and 82 b/w illustrations. £124.00. January 2019. The Emerging Technology of Big Data: Its Impact as a Tool for ICT Development Heru Susanto, PhD, Research Center for Informatics, The Indonesian Institute of Sciences, Indonesia; Honorary Professor, Tunghai University, Taiwan Fang-Yie Leu, PhD, Computer Science Department, Tunghai University, Taiwan Chin Kang Chen, PhD, Universiti Brunei Darussalam, Begawan, Brunei Looks at the new technology that has emerged to meet the growing need and demand and studies the impact of Big Data in several areas of today's society, including social media, business process reengineering, science, e-learning, higher education, business intelligence, and green computing. ISBN: 978-1-77188-675-8 / ebook ISBN: 9781351241250 324 pages with index. 24 color and 21 b/w illustrations. £124.00. Forthcoming April 2019. New & Forthcoming Titles from Apple Academic Press Microscopy Applied to Materials Sciences and Life Sciences Editors: Sabu Thomas, PhD, Mahatma Gandhi University; International and Inter University Centre for Nanoscience and Nanotechnology, India Ajay Vasudeo Rane, MTech, Composites Research Group, Durban University of Technology, South Africa Nandakumar Kalarikkal, PhD, Advanced Materials Laboratory, School of Pure and Applied Physics, International and Inter University Centre for Nanoscience and Nanotechnology, Mahatma Gandhi University, India Krishnan Kanny, PhD, Department of Mechanical Engineering, Durban University of Technology, South Africa Focuses on recent theoretical and practical advances in polymers and their blends, composites, and nanocomposites related to their microscopic characterization. It highlights recent accomplishments and trends in the field of polymer nanocomposites and filled polymers related to microstructural characterization. ISBN: 978-1-77188-672-7 / ebook ISBN: 9781351251587 526 pages with index. 36 color and 227 b/w illustrations. £139.00. November 2018. Mathematical Population Dynamics and Epidemiology in Temporal and Spatio-Temporal Domains Harkaran Singh, PhD, Khalsa College of Engineering and Technology, Amritsar, India Joydip Dhar, PhD, ABV-Indian Institute of Information Technology and Management, Gwalior, India Provides a useful experimental tool in making practical predictions, building and testing theories, answering specific questions, determining sensitivities of the parameters, making control strategies, and much more. The volume focuses on the study of population dynamics with special emphasis on the migration of populations in a heterogeneous patchy habitat, the human and animal population, and the spreading of epidemics. ISBN: 978-1-77188-671-0 / ebook ISBN: 9781351251709 302 pages with index. 46 color and 5 b/w illustrations. £124.00. December 2018. Plant- and Marine-Based Phytochemicals for Human Health: Attributes, Potential, and Use Editors: Megh R. Goyal, PhD, University of Puerto Rico, Mayaguez Campus Durgesh Nandini Chauhan, MPharm, Ishita Research Organization, Raipur, India Provides insight with scientific evidence on the use of medicinal plants in the treatment of certain diseases. It describes bioactive compounds of marine and plant origin that have been discovered to be advantageous for human health, shedding new light on the potential of phytochemicals and contributing to the ocean of knowledge on phytochemistry and pharmaceutical biology. In addition, the role of plant-based pharmaceuticals is also discussed as an example of innovative uses of plant product. ISBN: 978-1-77188-670-3 / ebook ISBN: 9781351251983 398 pages with index. 23 color and 37 b/w illustrations. £131.00. November 2018. Mechanical Engineering for Sustainable Development: State-of-the-Art Research Editors: C. S. P. Rao, PhD, National Institute of Technology, Warangal, India G. Amba Prasad Rao, PhD, National Institute of Technology, Warangal, India N. Selvaraj, PhD, Institute of Technology, Warangal, India P. S. C. Bose, PhD, National Institute of Technology, Warangal, India V. P. Chandramohan, National Institute of Technology, Warangal, India Provides valuable insight into diverse topics related to mechanical engineering and the state-of-the-art work on sustainable development being carried out throughout the world by budding researchers and scientists. It looks at Machine Design, Materials and Manufacturing, and Thermal Engineering. ISBN: 978-1-77188-681-9 / ebook ISBN: 9781351170161 672 pages with index. 347 b/w illustrations. £147.00. January 2019. Electronics and Communications Engineering: Applications and Innovations Editors: T. Kishore Kumar, PhD, National Institute of Technology, Warangal, India Ravi Kumar Jatoth, PhD, National Institute of Technology, Warangal, India V. V. Mani, PhD, Institute of Technology, Warangal, India Presents a selection of important current advancements in the electronics and communication engineering fields, focusing on signal processing, chip design, and networking technology. ISBN: 978-1-77188-693-2 / ebook ISBN: 9781351136822 Approx. 355 with index. 19 color and 201 b/w illustrations. £124.00. Forthcoming March 2019. Nanoscience and Nanoengineering: Novel Applications Editors: V. B. Dement'ev, DSc, Institute of Mechanics, Ural Division Russian Academy of Sciences A. K. Haghi, PhD, Editor-in-Chief, International Journal of Chemoinformatics and Chemical Engineering & Polymers Research Journal V. I. Kodolov, DSc, Department of Chemistry and Chemical Technology, M. T. Kalashnikov Izhevsk State Technical University, Izhevsk, Russia Examines important information and discussion on the new scientific trend of chemical mesoscopics and also sheds new knowledge on the science of nanomaterials, processes of nanochemistry, and nanoengineering. The volume explores nanomaterial development as well as investigations of processes and modeling. ISBN: 978-1-77188-696-3 / ebook ISBN: 9781351138789 392 pages with index. 13 color and 76 b/w illustrations. £124.00. January 2019. Highlights the latest advances and research in the interdisciplinary field of food engineering, emphasizing food science as well as quality assurance. The volume provides detailed technical and scientific background of technologies and their potential applications in food preservation. ISBN: 978-1-77188-706-9 / ebook ISBN: 9781351048644 362 pages with index. 10 color and 121 b/w illustrations. £124.00. February 2019. Presents many of the recent technological and research accomplishments in the area of nanomedicine and nanotechnology. Also discussed are the different types of nanomedicinal drugs with their production and commercial significance. Other topics discussed are the use of natural and synthetic nanoparticles for the production of drugs, different types of nanoparticles systems, drug carriers, wound healing antimicrobial activity, effects of natural materials in nanomedicine, and toxicity of nanoparticles. ISBN: 978-1-77188-703-8 / ebook ISBN: 9781351047883 370 pages with index. 14 color and 75 b/w illustrations. £124.00. January 2019. Engineered Carbon Nanotubes and Nanofibrous Material: Integrating Theory and Technique Editors: A. K. Haghi, PhD, Professor Emeritus of Engineering Sciences, Editor-inChief, International Journal of Chemoinformatics and Chemical Engineering & Polymers Research Journal; Member, Canadian Research and Development Center of Sciences and Cultures (CRDCSC), Montreal, Quebec, Canada Praveen K. M., University of South Brittany (Université de Bretagne Sud) – Laboratory IRDL PTR1, Research Center “Christiaan Huygens,” Lorient, France Sabu Thomas, PhD, Mahatma Gandhi University; International and Inter University Centre for Nanoscience and Nanotechnology, India Fully explores the development phase of carbon nanotube-based applications. It looks at carbon nanotubes and their applications in diverse areas of science and engineering and considers environmental engineering applications as well. A. K. Haghi, PhD, Professor Emeritus of Engineering Sciences, Editor-in-Chief, International Journal of Chemoinformatics and Chemical Engineering & Polymers Research Journal; Member, Canadian Research and Development Center of Sciences and Cultures (CRDCSC), Montreal, Canada Suresh C. Ameta, PhD, Dean, Faculty of Science, PAHER University, Udaipur, India Tanmoy Chakraborty, PhD, Associate Professor, Department of Chemistry, Manipal University Jaipur, India Presents new interdisciplinary research in chemical science and engineering technology, taking a conceptual and practical approach. The book includes case studies and supporting technologies and also explains the conceptual thinking behind current uses and potential uses not yet implemented. International experts with countless years of experience lend this volume credibility. ISBN: 978-1-77188-705-2 / ebook ISBN: 9781351048323 386 pages with index. 29 color and 118 b/w illustrations. £124.00. Forthcoming March 2019. ISBN: 978-1-77188-704-5 / ebook ISBN: 9781351048125 280 pages with index. 20 color and 76 b/w illustrations. £116.00. November 2018. Abhimannyu A. Kalne, MTech, Assistant Professor, Swami Vivekanand College of Agricultural Engineering and Technology and Research Station, Indira Gandhi Agricultural University, Raipur, India Looks at new and established technology for processing, physical and biochemical properties of fruits and vegetables and their products, challenges of the fruits and vegetables processing industry, and a few other related aspects, such as effect of processing on nutritional content, bioavailability, economic utilization of bio-wastes, and processing byproducts. ISBN: 978-1-77188-708-3 / ebook ISBN: 9780429505775 Approx. 384 pages with index. 26 color and 18 b/w illustrations. £124.00. Forthcoming March 2019. Computing Predictive Analytics, Business Intelligence, and Economics: Modeling Techniques with Startups and Incubators Editor: Cyrus F. Nourani, PhD, Research Professor, Entreprenurer and Independent Consultant Brings together research and system designs that address the scientific basis and the practical systems design issues that support areas ranging from intelligent business interfaces and predictive analytics to economics modeling. Among the areas that are being discussed are modern analytics, heterogeneous computing, business intelligence, ERP (enterprise resource planning), and decision science. Consumers have been pledging their love for data visualizations for a while now, and data is the area being explored, such as B2B and EC (ecommerc), E-business and the Intelligent Web, CRM (customer relationship management), infrastructures, and more. Chin Kang Chen, PhD, Lecturer, Universiti Brunei Darussalam, Begawan, Brunei Shows how ICT (information and communications technology) can play the role of a driver of business process reengineering (BPR). ICT can aid in enabling improvement in BPR activity cycles as it provides many components that enhance performance that can lead to competitive advantages. ISBN: 978-1-77188-711-3 / ebook ISBN: 9780429488573 248 pages with index. 7 color and 6 b/w illustrations. £124.00. March 2019. Mathematics for Engineers and Science Labs Using Maxima Seifedine Kadry, PhD, Beirut Arab University, Lebanon Pauly Awad, American University of the Middle East, Kuwait, Lebanon “Covers the essential topics that every engineer and science student needs to know in mathematics, not only theoretically but practically, using the open source software Maxima, so that students can improve their understanding of math by practicing in labs using Maxima. The examples in this book are arranged in increasing order of difficulty, and the step-by-step solutions make the book suitable for every student whatever his or her background or level. I recommend this book to accompany any mathematics book for engineering and science students. However, everyone can use it as a stand-alone for practicing and laboratory purposes.”—K. Smaili, Professor and Chair, Department of Applied Mathematics, Lebanese University ISBN: 978-1-77188-727-4 / ebook ISBN: 9780429469718 306 pages with index. 16 color and 158 b/w illustrations. £116.00. February 2019. ISBN: 978-1-77188-729-8 / ebook ISBN: 9780429465468 Approx. 275 pages with index. 14 color and 33 b/w illustrations. £116.00. Forthcoming April 2019. New & Forthcoming Titles from Apple Academic Press Medicinal Chemistry with Pharmaceutical Product Development Editors: Debarshi Kar Mahapatra, PhD, Assistant Professor, Department of Pharmaceutical Chemistry, Dadasaheb Balpande College of Pharmacy, Rashtrasant Tukadoji Maharaj Nagpur University, Nagpur, Maharashtra, India Sanjay Kumar Bharti, PhD, Assistant Professor, Institute of Pharmaceutical Sciences, Guru Ghasidas Vishwavidyalaya (A Central University), Bilaspur, India “Focuses on novel therapeutics and strategies for the treatment and/or management for various human ailments. I am delighted to read this book, which encompasses various principles and applications associated with medicinal chemistry and pharmaceutical product development. It integrates insights of drug discovery and development through various pharmacological aspects of products, druggable targets of drug candidates and approaches, including nanomedicines. The book will be useful for students, researchers, scientists, and teachers working in cutting-edge research in pharmaceutical technology.”—From the Foreword by G. S. Singh, PhD, FISCA Professor, Chemistry Department University of Botswana Gaborone, Botswana ISBN: 978-1-77188-710-6 / ebook ISBN: 9780429487842 400 pages with index. 11 color and 54 b/w illustrations. £124.00. February 2019. Holistic Healthcare, Volume 2: Possibilities and Challenges Editors: Anne George, MD, Associate Professor, Department of Anatomy, Government Medical College, Kottayam, Kerala, India Snigdha S. Babu, Doctoral Research Fellow, International and Inter University Centre for Nanoscience and Nanotechnology, Mahatma Gandhi University, Kottayam, Kerala, India M. P. Ajithkumar, PhD, Postdoctoral Fellow, International and Inter University Centre for Nanoscience and Nanotechnology, Mahatma Gandhi University, Kottayam, India Sabu Thomas, PhD, Mahatma Gandhi University; International and Inter University Centre for Nanoscience and Nanotechnology, India Showcases some recent trends in treating various diseases that plague mankind, including superbugs, drug side-effects, drug abuse, and myriad lifestyle-related diseases and syndromes that are wrecking our lifestyle. The book brings together chapters from many practitioners who pay attention to overall well-being of individuals. ISBN: 978-1-77188-715-1 / ebook ISBN: 9780429487804 342 pages with index. 8 color and 19 b/w illustrations. £124.00. Forthcoming April 2019. Handbook of Research on Food Science and Technology, 3-volume set Volume 1: Food Technology and Chemistry / Volume 2: Food Biotechnology and Microbiology / Volume 3: Functional Foods and Nutraceuticals Editors: Mónica Lizeth Chávez-González, PhD Full Professor, School of Chemistry of the Universidad Autónoma de Coahuila, Mexico Jose´ Juan Buenrostro-Figueroa, PhD Researcher, Research Center for Food and Development, A.C., Mexico Cristobal N. Aguilar, PhD Full Professor and Dean, School of Chemistry, Autonomous University of Coahuila, México This Handbook of Research in Food Science and Technology consists of three volumes focusing on food technology and chemistry, food biotechnology and microbiology, and functional foods and nutraceuticals. The volumes highlight new research and current trends in food science and technology, looking at the most recent innovations, emerging technologies, and strategies focusing on taking food design to sustainable levels. 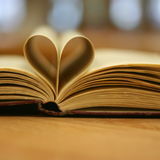 In particular, the handbooks includes relevant information on the modernization in the food industry, sustainable packaging, food bioprocesses, food fermentation, food microbiology, functional foods and nutraceuticals, natural products, nano- and microtechnology, healthy product composition, innovative processes/bioprocesses for utilization of by-products, development of novel preservation alternatives, extending the shelf life of fresh products, alternative processes requiring less energy or water, among other topics. The chapters present a plethora of research compiled by the Food Research Group of the School of Chemistry at the Universidad Autonoma de Coahuila (DIA-UAdeC), Mexico, which consists of research subgroups in bioprocesses and bioproducts, biorefineries, biocontrol, natural products, molecular biology and omic sciences, GLIC-biotechnology, nano-bioscience, edible coatings, films and membrane technology, food engineering, emerging processing technology, food science, and functional foods. Handbook of Research on Food Science and Technology, 3-volume set 61 b/w illustrations. 816 pages with index. ISBN: 978-1-77188-721-2 / ebook ISBN: 9780429487811 $449.95 US / £347.00. December 2018. Volume 1: Food Technology and Chemistry 19 b/w illustrations. 276 pages with index. ISBN: 978-1-77188-718-2 / ebook ISBN: 9780429487859 £124.00. Volume 2: Food Biotechnology and Microbiology 25 b/w illustrations. 264 pages with index. ISBN: 978-1-77188-719-9 / ebook ISBN: 9780429487835 £124.00. Volume 3: Functional Foods and Nutraceuticals 19 b/w illustrations. 276 pages with index. ISBN: 978-1-77188-720-5 / ebook ISBN: 9780429487828 £124.00. Sabu Thomas, PhD, Mahatma Gandhi University; International and Inter University Centre for Nanoscience and Nanotechnology, India Nandakumar Kalarikkal, PhD, School of Pure and Applied Physics and Joint Director, International and Inter University Centre for Nanoscience and Nanotechnology of Mahatma Gandhi University, Kottayam, Kerala, India Yang Weimin, PhD, Qingdao University of Science and Technology of China, Beijing University of Chemical Technology Kaushik Pal, PhD, Department of Nanotechnology; Center for Multidisciplinary Research Excellence (CMRE), Bharath University, India Highlights some of the latest innovations and principles of nanostructured polymeric materials and polymer nanocomposites. It is devoted to novel architectures at the nano-level with an emphasis on new synthesis and characterization methods. ISBN: 978-1-77188-724-3 / ebook ISBN: 9780429469794 380 pages with index. 20 color and 157 b/w illustrations. £124.00. Forthcoming April 2019. Perovskite Solar Cells: Technology and Practices Kunwu Fu, PhD, Quality Engineering, Wieland Metals Singapore Anita Wing Ho-Baillie, PhD, University of New South Wales (UNSW), Australia Hemant Kumar Mulmudi, PhD, Research School of Engineering, Australian National University Pham Thi Thu Trang, PhD, IREX Energy Joint Stock Company, a member of SolarBK, Vietnam “A quite exhaustive presentation of this particularly dynamic field, including its historical developments and current status and prospects. After a short introduction to the field, the main aspects of device operation are addressed, including the specific features of active and charge extraction layers. Specific considerations are finally presented regarding device stability, lead-free materials, and silicon-perovskite tandem solar cells. Considering the current status of perovskite devices, I am confident that this book will be of great support for students, technicians, engineers and researchers working in the field.”—Dr. Johann Bouclé, Associate Professor, XLIM UMR 7252, Université de Limoges/CNRS, France ISBN: 978-1-77188-728-1 / ebook ISBN: 9780429469749 332 pages with index. 130 b/w illustrations. £116.00. March 2019. Asmaa M. Marzouk, PhD, Faculty of Tourism and Hotels, University of Sadat City, Egypt Takes an in-depth look at workforce issues in the tourism and hospitality industry, focusing on labor skills, ethics, rights, and more. It examines manpower planning beyond forecasting estimates to include investigative techniques in a way that offers insight for economic planning in both tourism and tourism education. It also specifically covers the importance of ethics in the workplace and labor rights. The authors use economic, sociological, and psychological analysis and take a pragmatic stance on the challenges of the workforce. industries will benefit from the holistic view of the labor market. ISBN: 978-1-77188-731-1 / ebook ISBN: 9780429465093 Approx. 536 pages with index. 5 color and 25 b/w illustrations. £131.00. Forthcoming May 2019. The Neurological Treatment for Nearsightedness and Related Vision Problems: A Guide to Vision Improvement Based on 30 Years of Research John William Yee, DEd, RO, Professor of Optical Science, Seneca College, Toronto, Ontario, Canada “John William Yee has made a major personal effort to design preventive methods for this difficult problem, and these methods are effective. It is always difficult to pioneer an alternative treatment in a field as conservative as optometry, and it takes a bold 'soul' to take these first steps. John has made a strong personal commitment to his research. . . . In this book, he offers this knowledge to professionals. . . . His pioneering development of Ortho C shows promise to effectively prevent nearsightedness at the threshold. His standard of professionalism and his commitment to support the welfare of others sets a high example for all of us.” —From the Foreword by Otis S. Brown, Author of How to Avoid Nearsightedness,Waynesboro, PA, United States This volume introduces and explains an eye-opening treatment for correcting nearsightedness and related vision problems naturally and neurologically. The author presents his methodology on neurologically correcting primary refractive errors in the mild and moderate myopic range. Ortho C. (or orthoculogy, which is Latin for “correcting the whole eye”) is a natural treatment, requiring no alteration to the cornea. ISBN: 978-1-77188-732-8 / ebook ISBN: 9780429465048 Approx. 275 pages with index 8 b/w illustrations. £68.99. Forthcoming April 2019. New & Forthcoming Titles from Apple Academic Press Managing Human Capital in Today's Globalization: A Management Information System Perspective Heru Susanto, PhD, BOSDM, and Researcher, Research Center for Informatics, Indonesian Institute of Sciences, Indonesia; Honorary Professor, Tunghai University, Taiwan Fang-Yie Leu, PhD, Tunghai University, Taiwan Chin Kang Chen, PhD, Universiti Brunei Darussalam, Begawan, Brunei Explores important issues in human capital in human resource management as it relates to management information systems (MIS). It highlights when management information systems are implemented or changed and how the responsibilities of organizational members can be drastically altered. It discusses employee resistance as one of the main outcomes of this process and offers several behavioral strategies that can be implemented to involve employees in adopting effective MIS and in overcoming the resistance during change. ISBN: 978-1-77188-738-0 / ebook ISBN: 9780429457890 Approx. 450 pages with index. 3 color and 16 b/w illustrations. £116.00. Forthcoming May 2019. Human Health Benefits of Plant Bioactive Compounds: Potentials and Prospects Editors: Megh R. Goyal, PhD, University of Puerto Rico, Mayaguez Campus Ansar Rasul Suleria, PhD, Centre for Chemistry and Biotechnology, School of Life and Environmental Sciences, Deakin University, Australia Focuses on the importance of functional foods and their secondary metabolites for human health, presenting new insights with scientific evidence on the use of functional foods in the treatment of certain diseases. Statistical Methods in Psychiatry Research and SPSS, 2nd Edition M. Venkataswamy Reddy, PhD, Former Head, National Institute of Mental Health and Neuro-Sciences, India REVIEW OF THE FIRST EDITION: “Practicing physicians and psychiatrists, even those with academic pretensions, are often overwhelmed by study designs and statistical analysis. . . . The author [of this book] has recognized the statistical needs of physicians and has attempted to present a simplified approach to statistics. The book provides an overview of psychiatric research, classifies statistical methods, describes types of data and variables, introduces quantitative and qualitative variables, elaborates study designs, discusses descriptive statistics, illuminates the basis of statistical inference, explains statistical tests of significance, and introduces correlational, multivariate, and meta-analysis. Each chapter focuses on a single aspect, introduces the issues, describes statistical theory, and provides examples. It also provides details of how to use the Statistical Package for Social Sciences (IBM SPSS Statistics) computer program for such analysis. The book is an attempt to fill the long felt need for a simple statistical text, useful for physicians and psychiatrists. . . . It will certainly help those who have a basic familiarity with statistical methods and analysis . . . . The book steps in the right direction for those who want to independently analyze and interpret data.”—Indian Journal of Psychiatry, by K. S. Jacob, Department of Psychiatry, Christian Medical College, Vellore, Tamil Nadu, India This new volume has over 100 pages of new material, including several new appendixes. ISBN: 978-1-77188-781-6 / ebook ISBN: 9780429023309 442 pages with index. 103 b/w illustrations. £124.00. January 2019. ISBN: 978-1-77188-739-7 / ebook ISBN: 9780429457913 Approx. 409 pages with index. 3 color and 16 b/w illustrations. £124.00. Forthcoming May 2019. Devrim Balköse, PhD, Izmir Institute of Technology, Izmir, Turkey (retired) Heru Susanto, PhD, Computational Science & IT Governance Research Group, Indonesian Institute of Science A. K. Heghi, Editor-in-Chief, International Journal of Chemoinformatics and Chemical Engineering & Polymers Research Journal Focuses on different aspects of composite systems that are associated with research and development, helping to bridge the gap between classical analysis and modern, real-life applications. Suresh C. Ameta, PhD, PAHER University, Udaipur, India Looks at significant new research, methodologies, and applications in the fields of carbon nanotubes and nanoparticles. It explores a variety of new developments in advanced carbon nanotubes and nanoparticles along with the tools to characterize and predict their properties and behavior. It introduces and reviews methods that are most frequently encountered in sophisticated nano-scaled materials domains. ISBN: 978-1-77188-734-2 / ebook ISBN: 9780429463877 324 pages with index. 13 color and 95 b/w illustrations. £124.00. Forthcoming April 2019. ISBN: 978-1-77188-740-3 / ebook ISBN: 9780429457937 Approx. 350 pages with index. 17 color and 73 b/w illustrations. £124.00. Forthcoming February 2019. New & Forthcoming Titles from Apple Academic Press Management Strategies for Water Use Efficiency and Micro Irrigated Crops: Principles, Practices, and Performance Editors: Megh R. Goyal, PhD, University of Puerto Rico, Mayaguez Campus B. J. Pandian, PhD, Water Technology Centre, Tamil Nadu Agricultural University, India Presents new research and technologies for making better use of water resources for agricultural purposes. The chapters focus on better management to improve allocation and irrigation water efficiency and look at performance factors as well. Chapters look at irrigation technology, environmental conditions, and scheduling of water application. ISBN: 978-1-77188-791-5 / ebook ISBN: 9780429060601 370 pages with index. 31 color and 27 b/w illustrations. £131.00. February 2019. Editors: Punita Duhan, MBA, Meera Bai Institute of Technology, Department of Training and Technical Education, Government of NCT of Delhi, India Anurag Singh, PhD, Institute of Management Studies, Banaras Hindu University, Varanasi, India “A sincere academic endeavor to cover various facets of m-commerce in a comprehensive manner. . . . This book enables the reader to comprehend contemporary m-commerce concepts along with the emerging paradigms in a comprehensive manner. The volume systematically puts together the efforts of researchers across the world in the shape of empirical analyses and reviews of the myriad aspects of m-commerce. . . . An excellent reference resource and a handbook for detailed and up-to date knowledge about m-commerce.” —M. Jagadesh Kumar, Professor and Vice-Chancellor, Jawaharlal Nehru University, New Delhi, India ISBN: 978-1-77188-714-4 / ebook ISBN: 9780429487736 444 pages with index. 10 color and 60 b/w illustrations. £116.00. February 2019. Jaya Vikas Kurhekar, PhD, Department of Microbiology, Dr. Patangrao Kadam Mahavidyalaya, Sangli, India Nadia Sharif, PhD, Biotechnology Department of Lahore, College for Women, University, Lahore, Pakistan Covers a wide selection of topics in phytochemistry and provides a wealth of information on the fundamentals, new applications, methods and modern analytical techniques, state-of-the-art approaches, and computational techniques. With chapters from professional specialists from around the world, the volumes deliver a comprehensive coverage of phytochemistry. Phytochemistry, 3-Volume Set ISBN: 978-1-77188-762-5 / ebook ISBN: 9780429426278 1806 pages with index. 43 color and 239 b/w illustrations. £385.00. December 2018. Phytochemistry, Volume 1: Fundamentals, Modern Techniques, and Applications ISBN: 978-1-77188-759-5, ISBN: 9780429426223 684 pages with index, 14 color and 130 b/w illustrations. £131.00, December 2018. Phytochemistry, Volume 2: Pharmacognosy, Nanomedicine, and Contemporary Issues ISBN: 978-1-77188-760-1 / ebook ISBN: 9780429426193 620 pages with index. 10 color and 64 b/w illustrations. £131.00. December 2018. Phytochemistry, Volume 3: Marine Sources, Industrial Applications, and Recent Advances ISBN: 978-1-77188-761-8 / ebook ISBN: 9780429426155 502 pages with index. 19 color and 45 b/w illustrations. £131.00. December 2018.